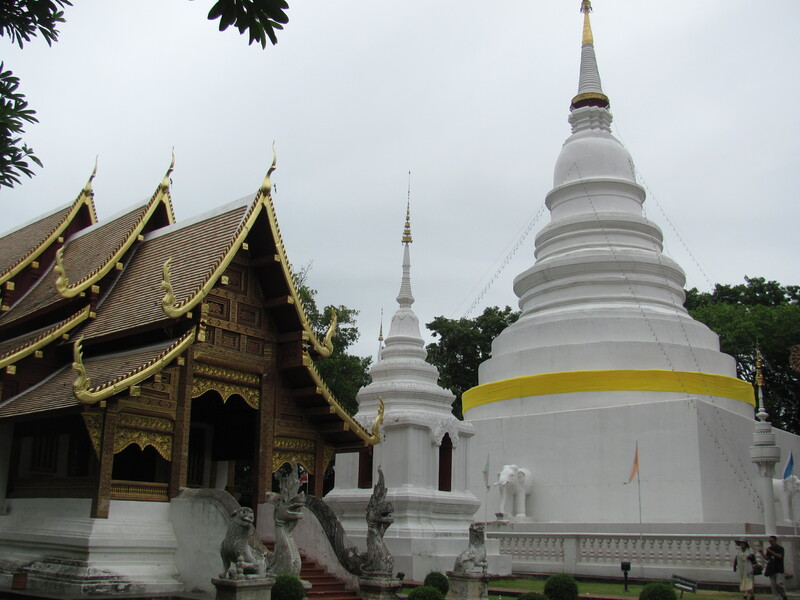 As promised, I will use this second post on Chiang Mai to give you an idea of the history and sights in the city itself. 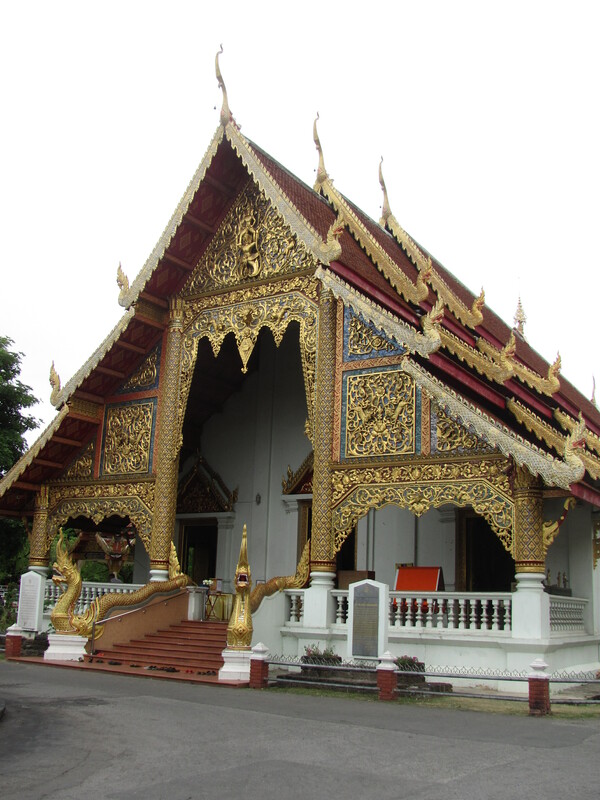 Chiang Mai is in northern Thailand and is the hub of the Lanna region. Many hill tribes are found in the area, some of which have relocated due to turmoil in Laos, China and Burma (Myanmar) in recent decades. 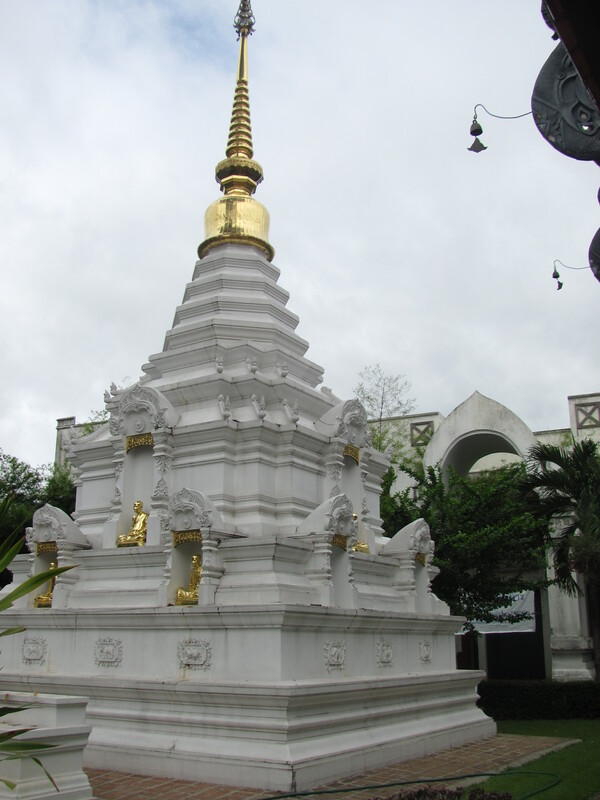 Chiang Mai itself was actually attacked by the Burmese in the 1500s and again in the 18th century, when it was left virtually unpopulated. 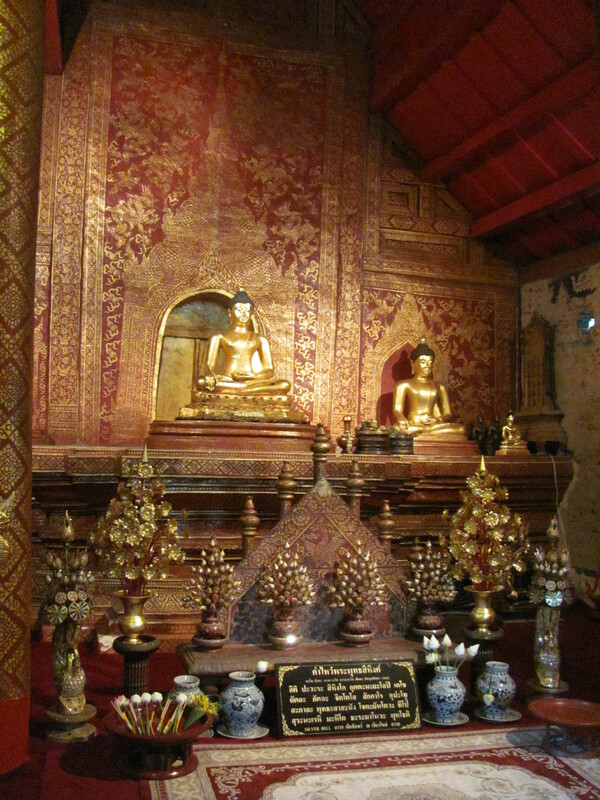 The city was founded in 1296 and many of the wats (temples) that you find there were originally built in the 1300s. The old part of the city, where I stayed, is a walled-in rectangle (about 2-3 km on each side) surrounded by a moat, now referred to as the canal. 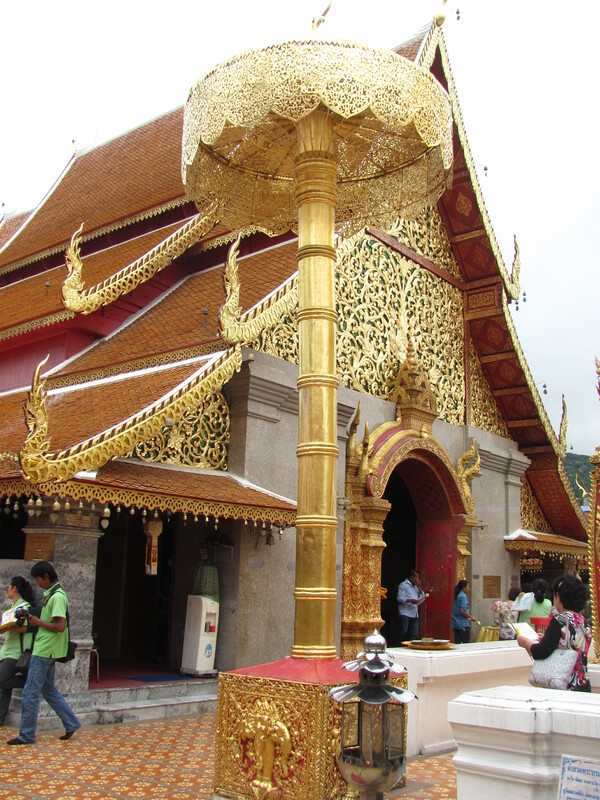 You could spend many days just exploring the streets, the wats and the markets. 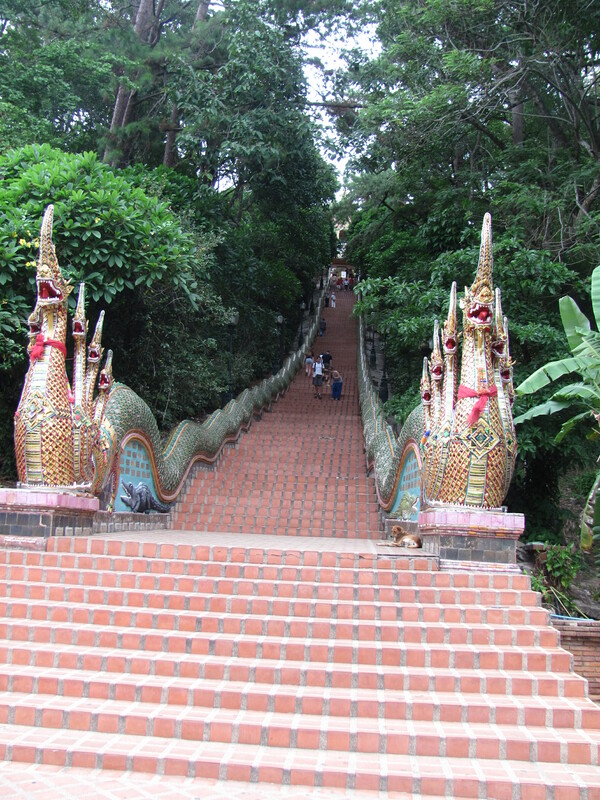 The surrounding valley and mountains also offer a wide range of activities. 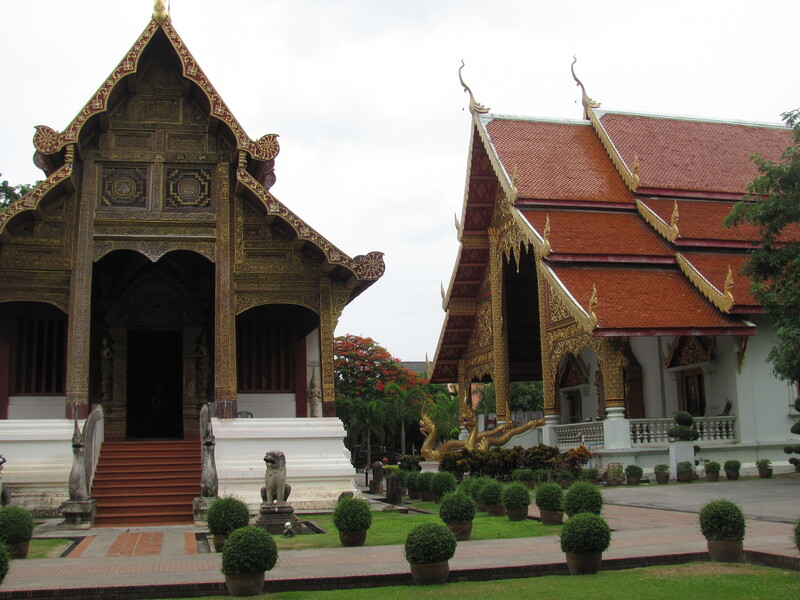 Because of its location near Laos, Myanmar, Cambodia and Vietnam, and because it is a very inexpensive area, Chiang Mai has become popular with young backpackers and tourists who are headed for other parts of Southeast Asia and the Golden Triangle. 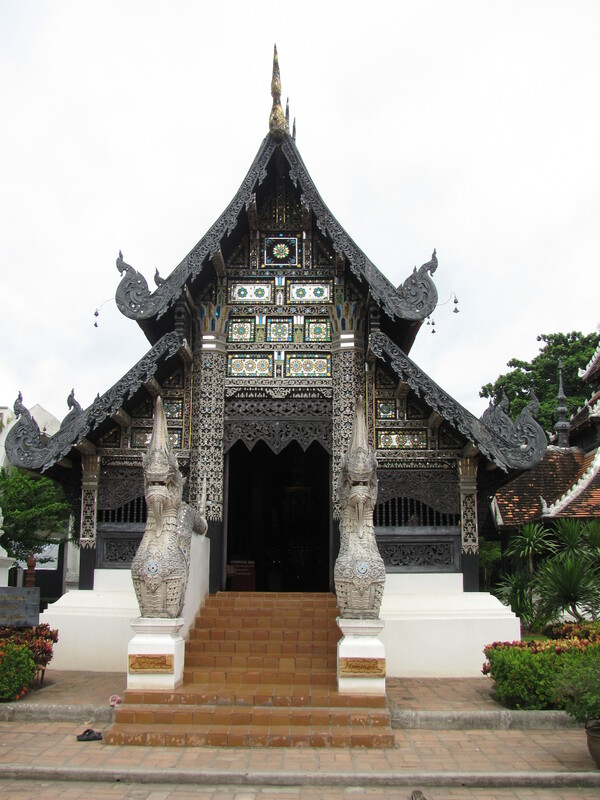 It is famous for its wats (there are over 300 in the city and the surrounding areas), Thai cooking schools and markets with hilltribe and Lanna crafts. 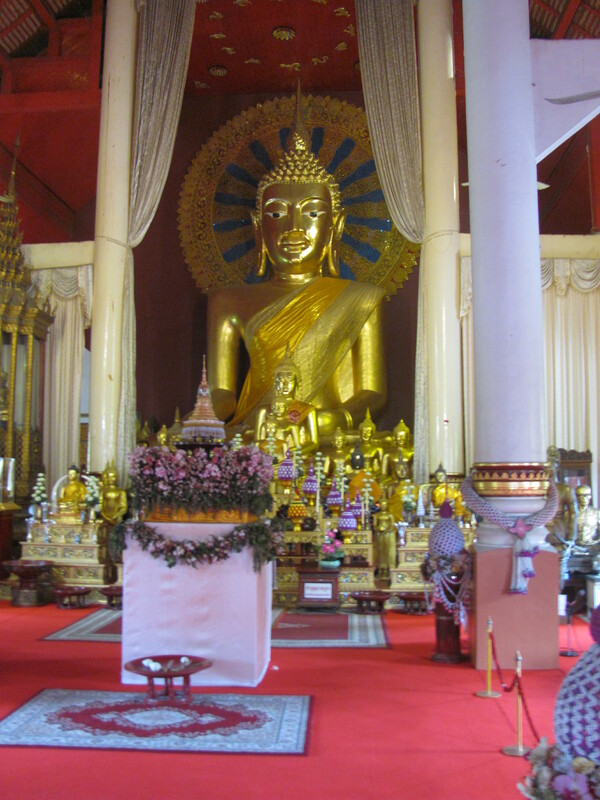 It is not pristine and it is clear that it you are in a developing part of the world, but it has amazing cultural attractions, it is very safe and the people of northern Thailand are gracious and charming beyond words. I was struck, once again, that as beautiful and interesting as some places are in this part of the world, it is always so much more about the people. I apologize ahead of time for not knowing all of the history of the wats I visited, but it would take many months to get up to speed on all of it. I visited lots and lots of wats, but will mainly include photos from three. 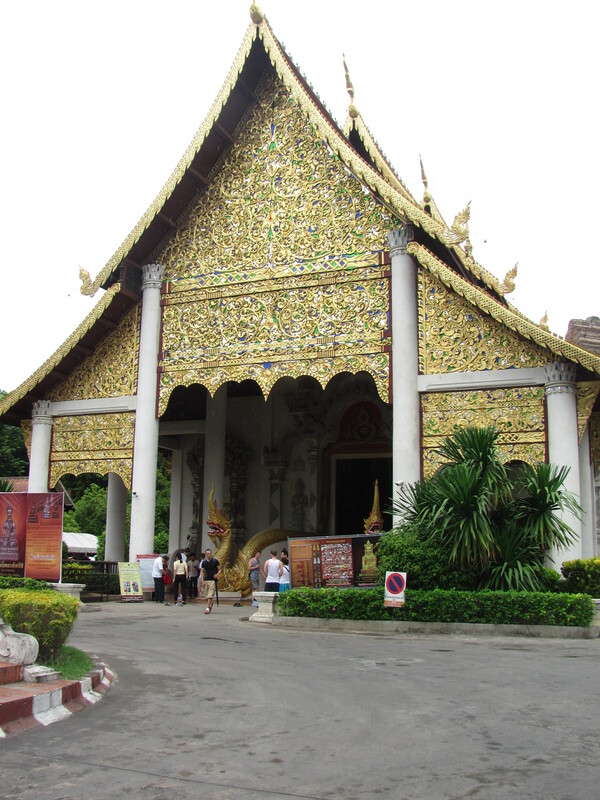 Each of these wats are really temple compounds and there are a number of buildings and smaller temples on the grounds. 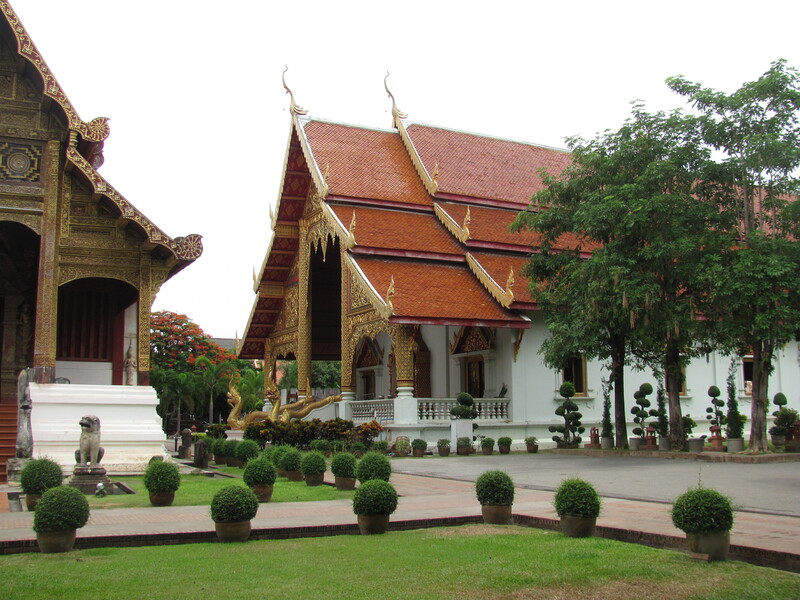 Wat Phra Singh was a 5 minute walk from my hotel and was a great introduction to the architecture and history of the area. 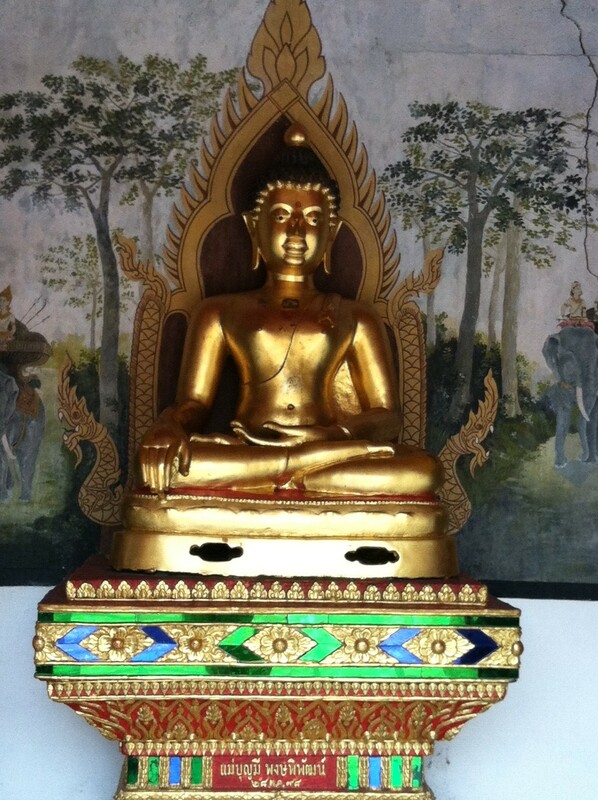 It dates back to about 1345 and has undergone a number of restorations. 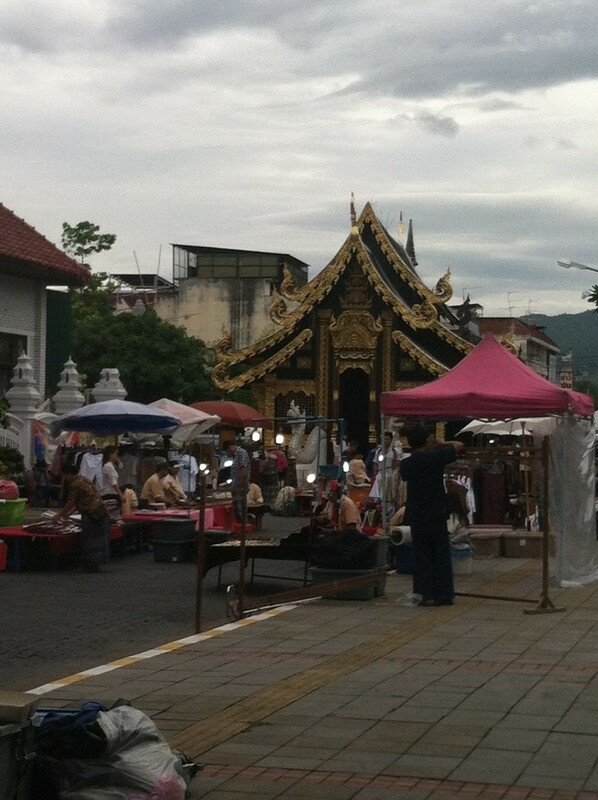 It is also sort of a district office for the monks. I am simply going to attach photos and let them speak for themselves. 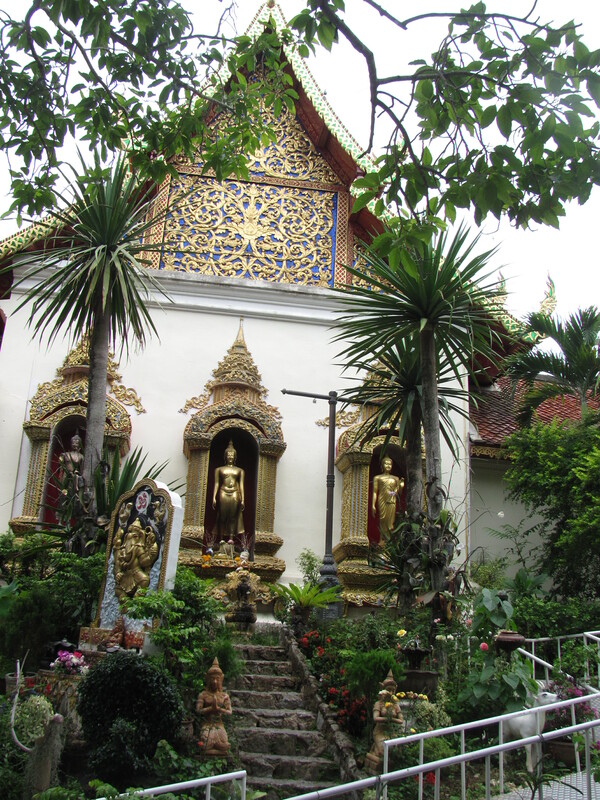 Wat Chedi Luang is about a five minute walk from Wat Phra Singh. 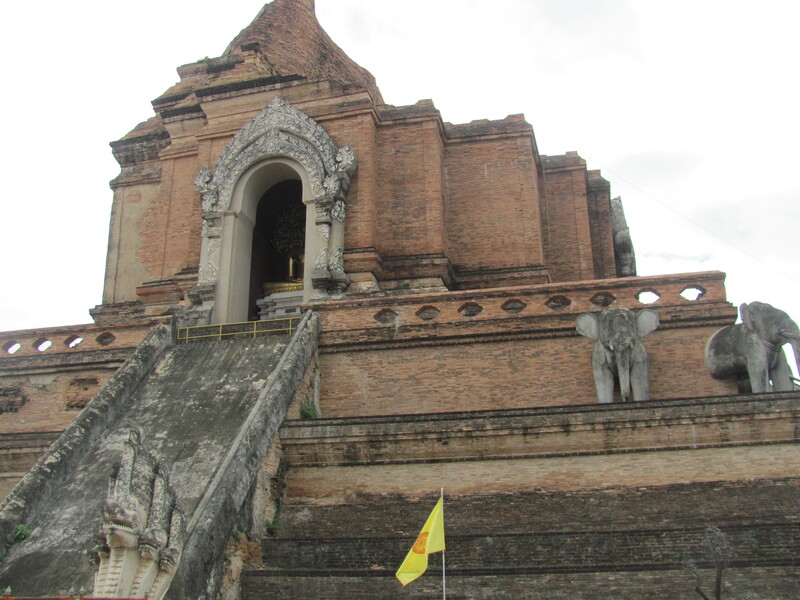 The original chedi is the large brick structure, which lost about 30 meters of height during an earthquake in 1545. 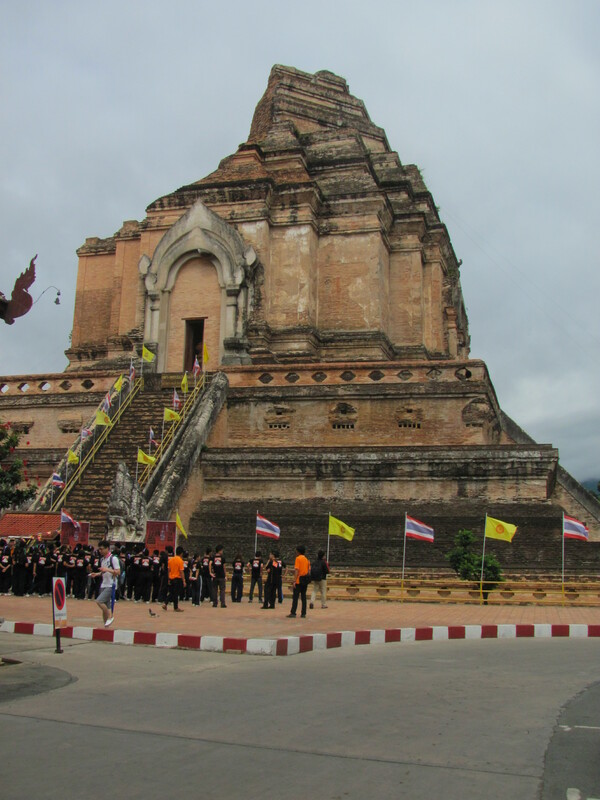 Many Thais come to visit this wat annually and a number of school groups were there when I reached it. 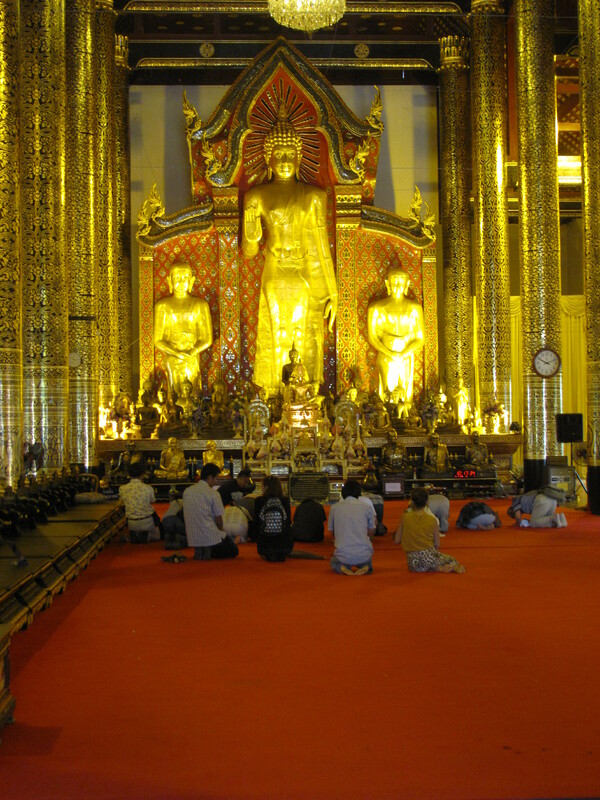 People were actively praying and chanting in some of the temples, so I did not take too many interior photos out of respect, although it is permitted. 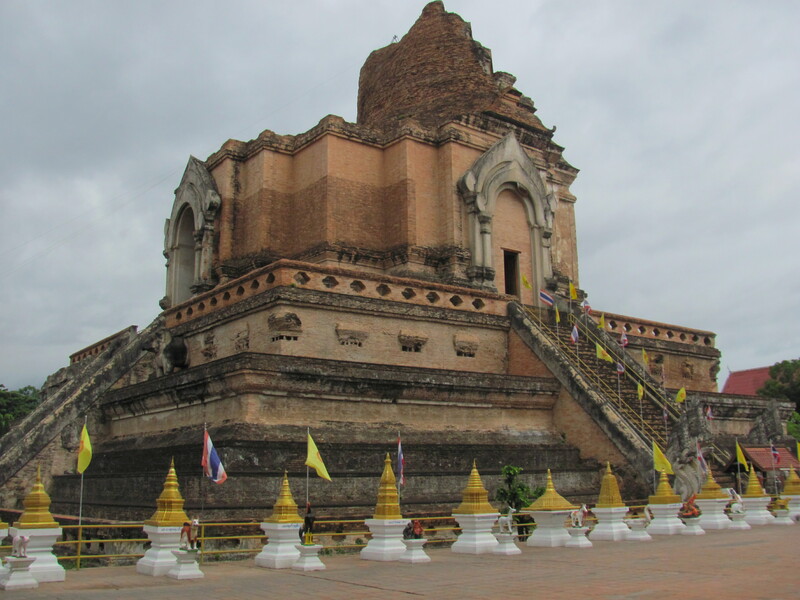 Hopefully these photos of the Chedi Wat, as it is often called, will give you some idea of the just how much stunning architecture and history are combined in this amazing place. I visited lots of smaller wats; they are literally tucked into streets and neighborhoods throughout the old and newer parts of the city. 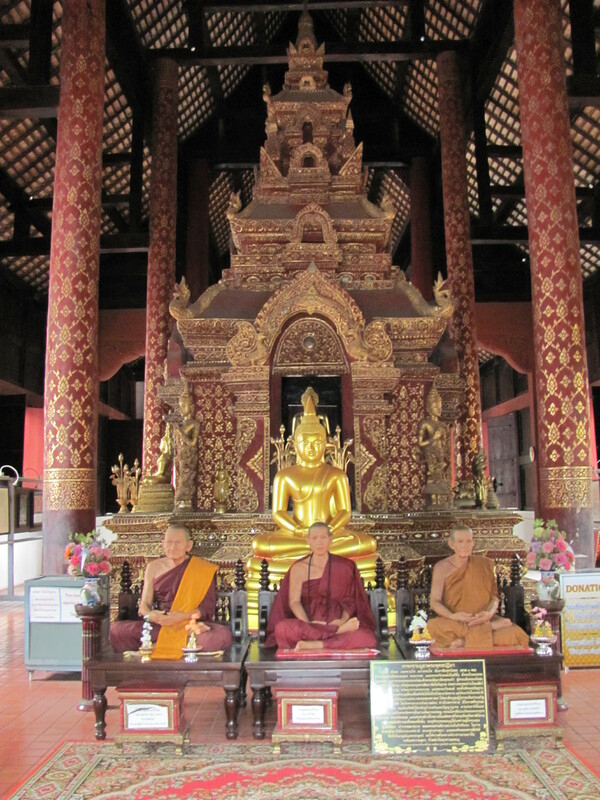 You really need more time in Chiang Mai to even begin to explore this treasure trove of history, religion and architecture. 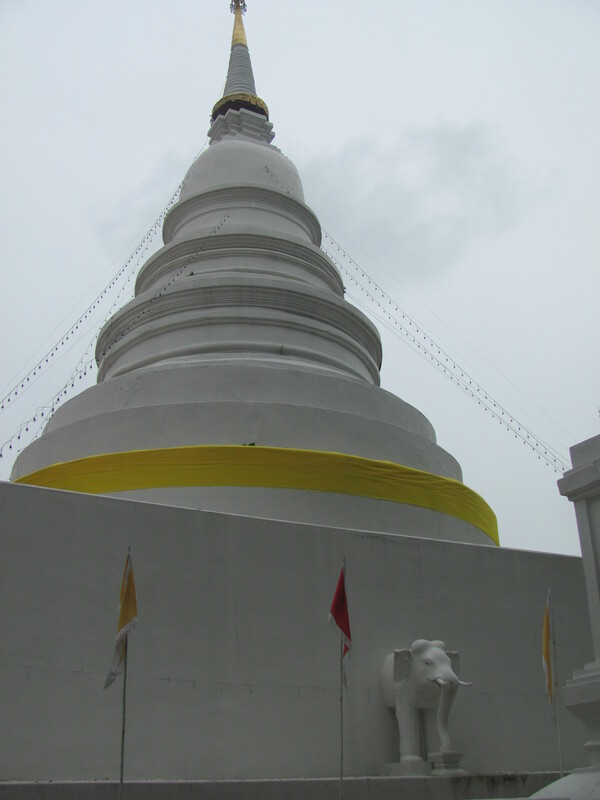 The last wat I visited is located on a mountain about 15 km from town. 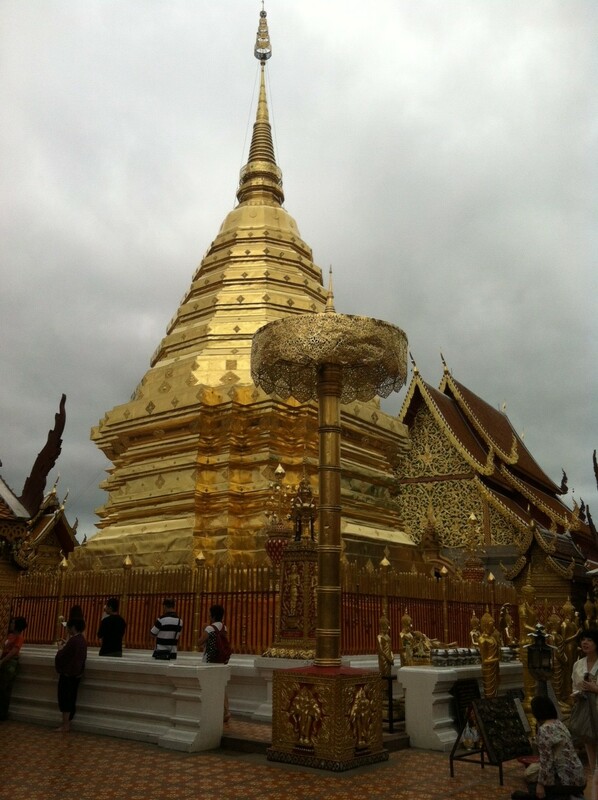 It has a longer name but it, and the mountain, are referred to as Doi Suthep. 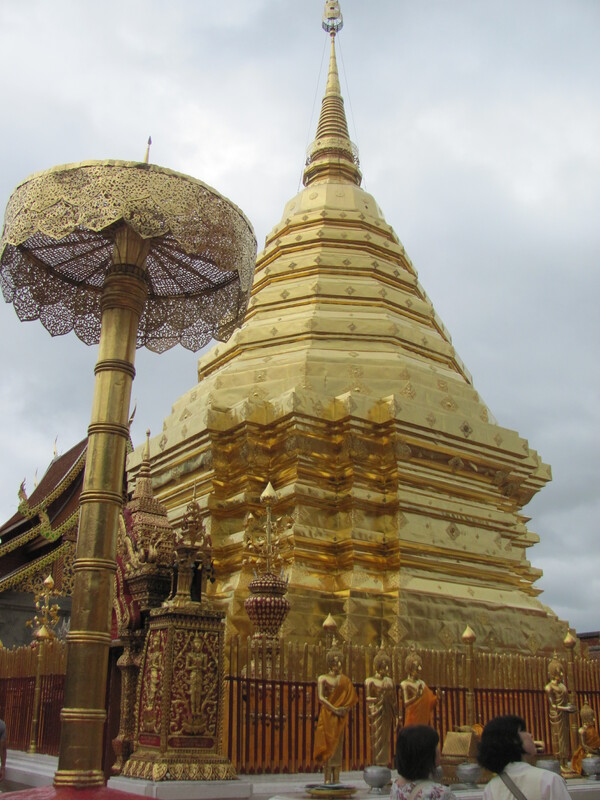 Other than the amazing view, which is in my first post, some distinguishing characteristics are the 300 steps that lead to the main temples and the golden umbrellas that are part of the rich Lanna tradition. 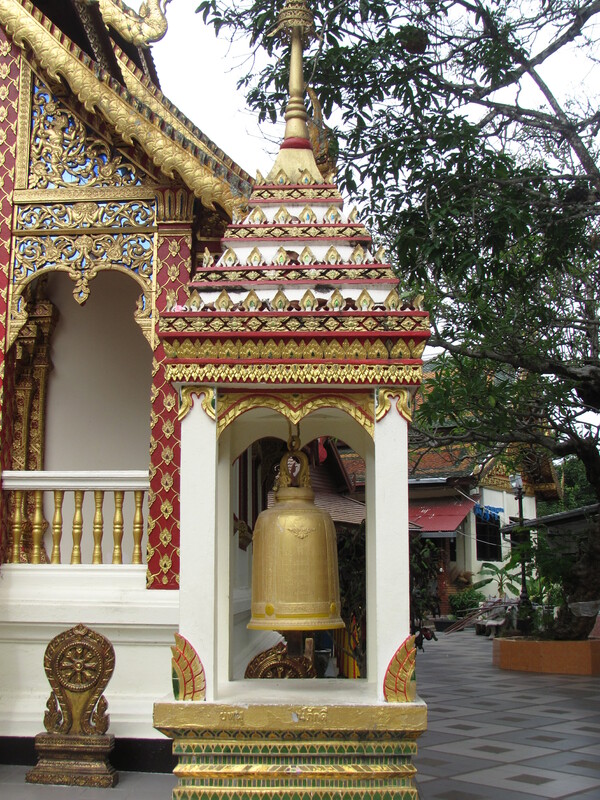 Doi Suthep is highly revered by Thais and is visited by large numbers of tourists and Thais each day. 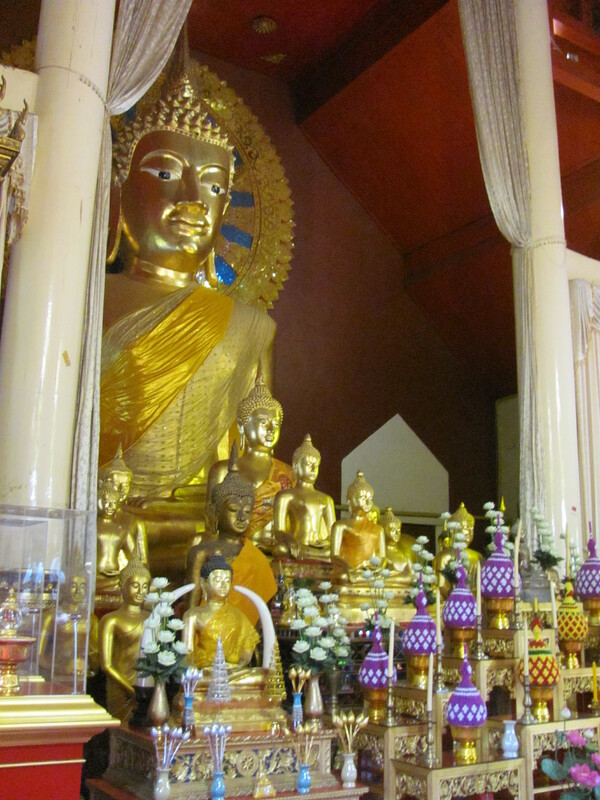 It still manages to be a very serene place. 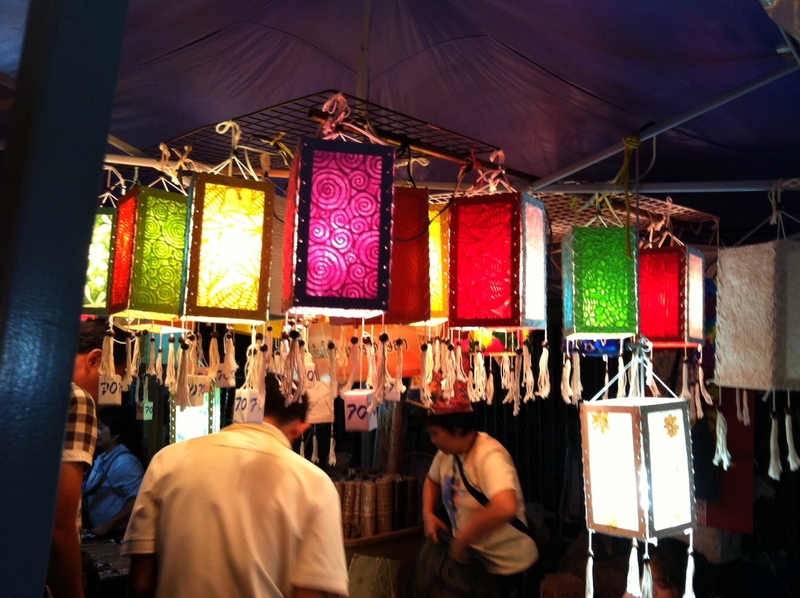 A Lantern seller at the Saturday Walking Street market. And one last elephant photo. This lady seems to know she is one of the lucky ones! 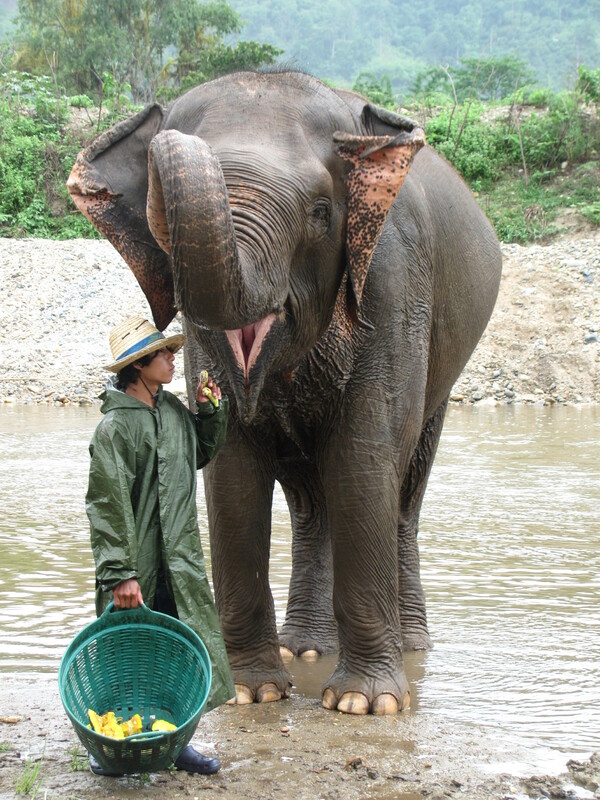 The newest rescue at the Elephant Nature Park with her mahout. She seems to be smiling!